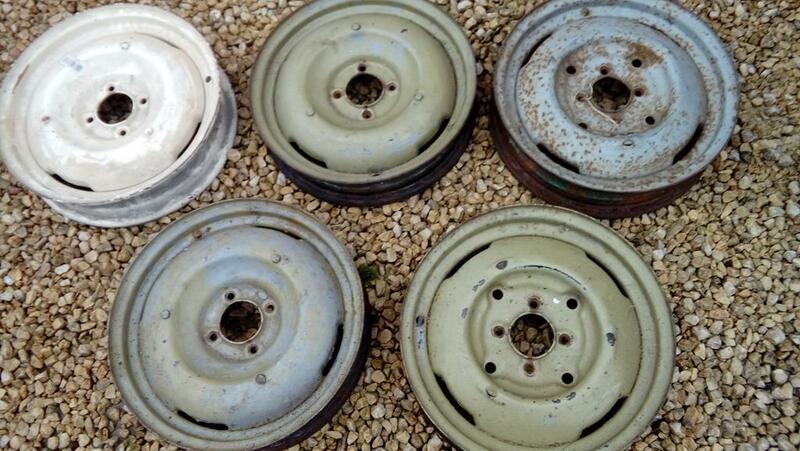 This is a set of five Austin A40 (Devon/Somerset) 16" steel wheels. As can be seen in the photo there are two wheels that have slightly different centres, an extra set of holes that are most probably for access to brake adjusters. These wheels are 3.5 inch wide as is the cream coloured one and the other two are 3 inch wide. These wheels are getting increasingly hard to get and are a popular choice with hot rodders as they will fit the popular Ford 4x108mm bolt pattern as well as there originally intended Austin vehicles. The wheels are in Paisley Scotland if you wish to view or collect. They are surprisingly heavy so a pallet may be a better idea for postage rather than a courior. A local courior has said that they will do the normal mainland UK address for £33.99 and it would be more for Highlands, Islands, etc. I have these wheels listed on Ebay too and have been asked if I would split the set and sell a pair of these wheels. I would be willing to do this if I had enough interest in the remaining single wheels or pairs. So if you require just one or two rims message me otherwise I would prefer to sell as a full set. I am looking for £129.99 for all five wheels but will always listen to sensible offers.